Well – we stan complexity. In this edition of “Let Us Introduce You To…” we showcase a song that highlights how that nostalgic R&B feel is built in Kpop by using numerous beats, harmonies, and even rap cadence to hook listeners by producing a new sound that simultaneously feels familiar. Press Play to Hear “Lock You Down” from SHINee’s album The Story of Light EP 3 (released June 25, 2018). Press Play to Hear “Nasty Girl” from Vanity 6’s album Vanity 6 (released August 11, 1982). Learn more about Vanity 6 – a girl group that was produced by Prince. Press Play to Hear “It Takes Two” from Rob Base and DJ E-Z Rock’s album It Takes Two (released August 9, 1988). Learn more about Rob Base and DJ E-Z Rock, and read about how this song became a classic! BTS is pleased to meet you! Not only do Korean producers strive to mix (and remix) Eastern and Western musical elements, they work closely with Western singer/songwriters and producers or purchase western-based music tracks for use by Korean artists (Note: purchasing tracks is a popular practice in the global music industry. Demo tracks, guide vocals, backing vocals are some terms you can search to learn more). KPK members have noted that Kpop fans may not be familiar with why many songs sound familiar to them. This realization was crystallized when TVXQ released their strong R&B ballad “Before U Go,” (2011) which includes a partial guitar riff from the Isley Brother’s song “Voyage to Atlantis” (1977) – many people, instead, could only reference Chris Brown’s song “Take You Down” (2008) – which still echoes the musical composition of the aforementioned Isley Brothers song. Moreover, recognition gaps go beyond music composition to include singing styles, choreography, and song instrumentation or arrangement. Additionally, we’ve found that such oversights are glaring in academic literature, which overwhelmingly focuses on K-pop music as a political tool or economic commodity (Lee 2008, Jang & Paik 2012, and see this bibliography). The “Let KPK Introduce You To…” blogpost series hopes to help Kpop fans discover links between what they hear in Kpop songs (or see in Kpop promotions) and the recent history of American music and popular culture – from a particular song or a musician’s vocal runs to costuming, training, dancing, or overall presentation. The primarily audio/visual – and brief – blog posts will open with the K-pop artist song,concept, or performance and then readers will be introduced to the “why it sounds familiar” song, concept, or performance. The entry will end with brief biographical or explanatory text of the “original” artist, sound, idea, or concept. Simple right? Part lay ethnomusicology and part historiography, the series offers a gateway for music enthusiasts to contextualize the foundation and development of Kpop music, and for critics to move beyond discussions of cultural appropriation in K-pop and toward the more likely premise of global creative collaboration. 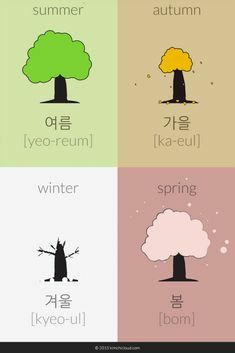 If you’ve ever heard or seen a Kpop song, dance, styling, or presentation and and thought “that sounds like/looks like/feels like/reminds me of…,” this series is for you! Look forward to it. Fuhr, Michael. Globalization and popular music in South Korea: Sounding out K-pop. New York: Routledge. (2015). Jang, Gunjoo & Won K. Paik. Korean wave as tool for Korea’s new cultural diplomacy. Advances in Applied Sociology, 2(3): 196-202. (2012). http://file.scirp.org/Html/22229.html (16 June 2016). Lee, Keehyeung. Mapping out the cultural politics of the “Korean Wave” in contemporary South Korea. In C.B. Huat and K. Iwabuchi (Eds.) East Asian Pop Culture: Analyzing the Korean Wave. pp. 175 – 189. Aberdeen: Hong Kong University Press. (2008). It used to be that if you wanted to browse a library’s bookshelves, check out a book, or ask a quick (or deeper) reference question, you had to visit the brick-and-mortar library building. However, that is not the case anymore – modern libraries have online catalogs that users can search, and those catalogs often include electronic books that can be downloaded into commercial e-readers and tablets. For those of us who prefer paper versions, those same catalogs offer features like remote requesting, book reservations, and even tagging options so you can tell other readers about the book using short and sweet descriptors. Subsequent library anxiety studies echo Mellon’s findings, expanding them to other library user groups and focusing on affective aspects (Qun & Onwuegbuzie, 1998; Onwuegbuzie & Qun, 2000). To help mitigate users’ concerns about the library (and to avoid that pesky physical library visit), I use tools that help me implement distance education. One tool I use is Screencast-O-Matic, which I discovered during my work here at KPK. Screencast-O-Matic (SOM) is an online tool that records computer screen activity. The service also hosts SOM videos, creating a library for account users. Users can make their videos public via Screencast-O-Matic, download the files to their personal computers, or upload their files directly to YouTube. SOM is a freemium service: a basic account with some features is free, and users can pay a yearly fee to get advanced features like longer recording times, video editing tools, and more. One cool feature that comes with the free version: users can annotate sections of videos – a great help for referencing web links, readings, and other important points that may be discussed in a teaching video. As I mentioned earlier, I learned about SOM while doing research for KPK projects. I needed a tool that would record Hallyu-related websites, and I also wanted to be able to keep videos showcasing artists and groups from the same entertainment company together. I also wanted to be able to host all of the videos in one place and download the files for future maintenance or archiving if needed. Since SOM allows me to do all of these things, I began using it for KPK’s Digital Documentation project. At post time, there are over 500 video recordings, which are included in other KPK projects, including KPOPIANA. One of the things I do as an academic librarian is create tutorials that help people understand how to effectively use library tools like the online catalog, article link resolvers, and databases. I also give lectures to students in graduate Library and Information Science (LIS) programs. SOM allows me to create on-the-fly tutorials for students when they stop in for Research Consultations or pop-in for a virtual visit at our library’s Ask A Librarian chat page. Since SOM creates unique links for each video, I’m able to send it to users and alert them to download the file for their own use whenever they need a refresher (yay, library anxiety reduction!). I also use SOM in tandem with Prezi, a presentation software, for my LIS graduate school lectures. That unique SOM link means that I can teach asynchronously – students can access my lectures on their own time and leave comments about my talk at the video site. I often use the video annotation feature to reference portions of my talk with readings they’ve been assigned. The Screencast-O-Matic Interface. Credit: Kaetrena Davis Kendrick, M.S.L.S. SOM is very easy to use. All that’s needed is a computer, an Internet connection, and if you plan to talk, a good quality headset. Do you use screencast software? Which ones are your favorites and why? Share what you’re doing and what you’ve learned during your own screencasting activities in the comment section. *ACRL Information Literacy Competency Standards for Higher Education published in 2000. ACRL is currently updating these standards, and you may find the ACRL’s more current Framework for Information Literacy for Higher Education document helpful. Mellon, C. (1986). Library anxiety: A grounded theory and its development. College & Research Libraries, 47(2): 160-165. Onwuegbuzie, A. J. & Qun, G. J. (2000). “I’ll go to the library later: The relationship between academic procrastination and library anxiety.” College & Research Libraries, 61(1), 45-54. Qun, G.J. & Onwuegbuzie, A. J. (1998). “Perfectionism and library anxiety among graduate students.” Journal of Academic Librarianship, 24(5), 365-71. 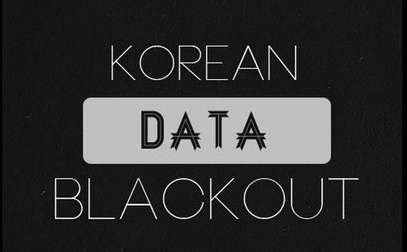 During KPK’s early days in 2011, Dr. Anderson and other KPK founders were having quite a difficult time accessing some Kpop entertainment companies’ artist websites. They kept encountering what they called, “the circle of death,” and then timing out. I wasn’t having this problem and had just discovered the Screencast-O-Matic tool, so I decided to record the sites and send the video links to my KPK colleagues. Interweb troubles in 2011….DD to the rescue! And that is how the the KPK Digital Documentation (DD) project was born. While the original intent of my website recordings was to share the Kpop website love, I quickly realized that recording Kpop websites could be useful in other ways: to track changes in Kpop web design, to understand how Korean entertainment companies use websites to engage Korean and international Kpop fans, and what roles these sites seem to play in the company’s larger business, marketing, and promotional plans – particularly when it comes to attracting new talent and integrating social media channels and tools. Recording websites can take between 2 to 15 minutes per site- occasionally more if the website is dense. I choose to record the websites without sound in order to avoid copyright infringement and so that visitors may enjoy and engage in unbiased viewing or analysis of the website. In Kpop, many artists and groups release several music projects a year, so I keep up with Kpop news outlets to find out about debuts and comebacks, and I try to record the different websites for each project. In this way, the DD project creates depth not only by seeking out general trends, but also monitoring the evolution of individual groups and artists. Additionally, if artists and groups promote in Japan, I record those websites if they are available. 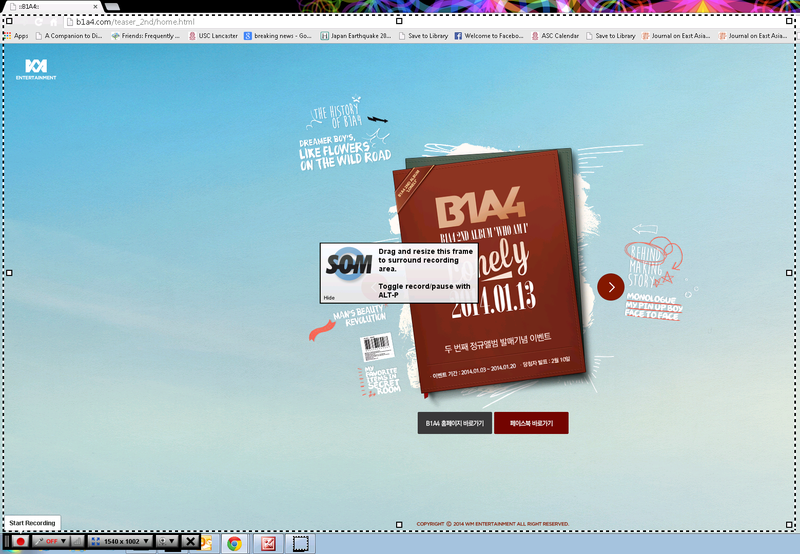 Recording B1A4’s latest website. See Screencast-O-Matic interface (dotted lines, recording control panel). One of the first things I noticed is that SM Entertainment was the only company that still gave historical access to websites supporting their early artists (Shinhwa, S.E.S., Yoo Joung Jin, etc. ), so I quickly recorded those websites. It’s a good thing that I did, because in 2012, the company completely redesigned their website, removing any content about artists who were not currently on their roster. SM Entertainment continues to allow access to the older websites of groups who are still on their roster (e.g., Girls Generation, SHINee, TVXQ! etc. ); additionally this company provides links to modified liner notes (e.g., lyrics, music publishing information, etc.). Those sites have been recorded for posterity, as well. In contrast, other companies like YG Entertainment or FNC Music Entertainment only offer current editions of artists websites – that is, viewers only have access to the current promotional concept of a group or artist, even if some historical information may be available (see below). Additionally, some companies (Starship Entertainment, TS Entertainment) only offer quick profile information about their artists on their websites. Instead they choose to use Cafe Daum’s “internet cafe” sites, which act as a hybrid website/forum, to promote their artists. Since Cafe Daum Official Kpop artist sites are generally designed to reach Korean Kpop fans, I do not record these sites for KPK. 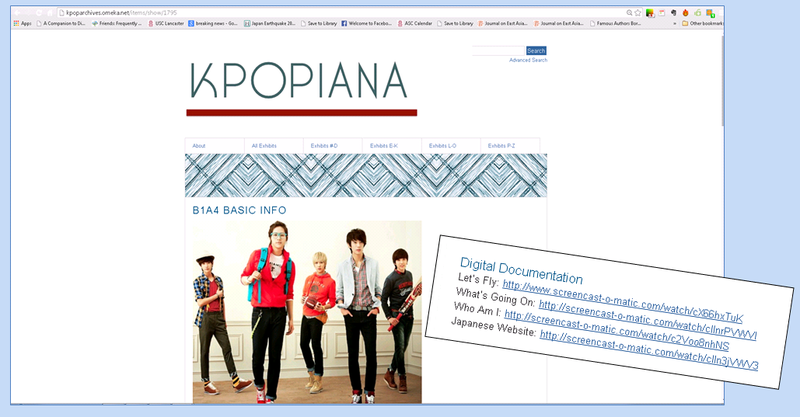 B1A4 Kpopiana exhibit with Digital Documentation links. When this project first began, KPK members were more engaged in collecting information, so DD videos were listed on the KPK website, separately from the artist profiles. As we move on to curation activities, these video links are now included in KPOPIANA artist exhibits. 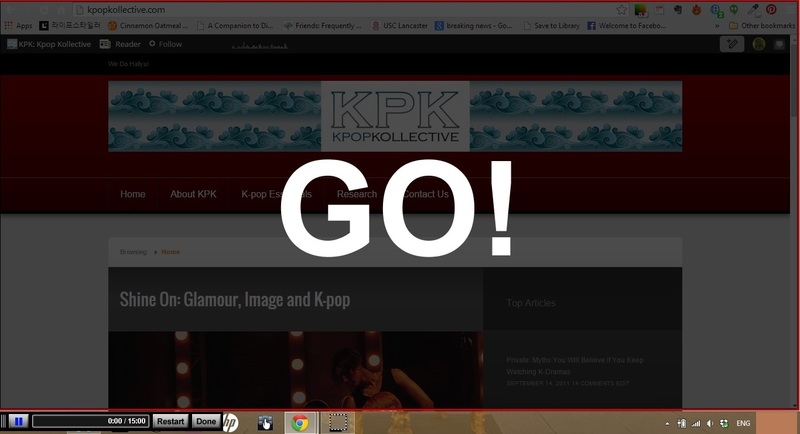 At press time, KPK has a DD library of almost 500 Kpop artist websites, from all kinds of Korean entertainment companies and encompassing all kinds of artists, Kpop choreographers, some international fansites, and even Kdrama actors. Currently we are focused on releasing DD items pertaining to Kpop artists, with plans to include other items in the future. The Library of Congress (n.d.) notes that the average length of a website is about 44 days. Considering the frenetic pace of music production in Kpop, this length may sometimes be shortened, making the DD project a useful tool in the study of Hallyu and its life on the Internet. Click to learn more about the DD project, or you may contact me anytime. Library of Congress. (n.d.). Importance of digital preservation: Special presentation. Accessed April 17, 2014, from http://www.digitalpreservation.gov/about/presentation.html. When you click the “KPK Members” link on our site, our bios’ upbeat language states we have certain skill sets that match well with the work of KPK, and you know that we are Kpop fans. I think our identification as Kpop fans is one of the unique characteristics of our collaboration. While KPK members approach the work of KPK as people who truly enjoy and participate in Kpop culture and some associated activities, our passion for Kpop is a minimum requirement for the work we do. Our work also requires the courage to forge a path in a niche research area within a discipline that is still developing, a willingness to perform due diligence, and not unlike the most successful Kpop idols, the will to perform seemingly repetitive actions in pursuit of a professional and cohesive body of work for an audience who’d like to consume a quality product. Stop calling it “digital humanities.” Or worse, “DH,” with a knowing air. The backlash against the field has already arrived. The DH’ers have always known that their work is interdisciplinary (or metadisciplinary), but many academics who are not humanists think they’re excluded from it….it seems more inclusive to call it digital liberal arts (DLA) with the assumption that we’ll lose the “digital” within a few years, once practices that seem innovative today become the ordinary methods of scholarship. DH (or DLA) labels aside, KPK is performing the unique work of organizing Kpop artist information and Kpop fan activities during a time when DH standards are wide-ranging and many actions that were once considered within the discipline have been challenged as the field evolves. When KPK considers adding new projects or updating current ones, we revisit the evolving rules of DH and work to reconcile them with the KPK educational mission. Because of this evolution, our passion for Kpop (“let’s gather every single photo we can find of Eric because Shinhwa is awesome!”) has always been tempered by the scholastic/research activity of due diligence (“which photos of Shinhwa reflect a certain aspect of the group’s position in/influence on Hallyu’s development”). Burdick et al. assert that one of the characteristics of DH is “an emphasis upon curation as a defining feature of scholarly practice” (2012, 122). KPK’s projects reflect this characteristic because of our ongoing commitment to adhere to the latest standards where we can, and to question any standards that seem exclusionary to scholars who are doing good works in unconventional DH environments. Hand-in-hand with due diligence is the time it takes to seek, evaluate, master, train others, and implement new technologies and curate our information so KPK’s work can be made public and is easily disseminated. When we started KPK two years ago, we used two tools for content creation: WordPress and Google Docs. As our work evolved towards curation, we discovered more tools and applied them to our work. More recently, KPK members have been trained on or exposed to a variety of digital curation platforms, including Omeka, Timeline JS, and Mindomo. While these technologies make information gathering and presentation easier, it still takes quite a while to get work done. For instance, it takes about 4 hours to gather and curate all the items for the average KPK artist profile, and another 2 hours to input the items into KPOPIANA. That doesn’t take into account how long it takes to set up the artist’s exhibit. Since a lot of Kpop information is strewn all over the Internet (and in some cases, is contradictory or not available at all), this work can be tedious and repetitive – especially if you’re working on an artist that you don’t know well (or know, but who is not your favorite). Add this time to the hours we spend tagging and adding news to our information archive, annotating interesting articles, locating scholarly work, talking to fans, and preparing data for presentations, it becomes quickly apparent that my while my enjoyment of Kpop helps me get the job done, it isn’t the actual work of KPK. The interesting thing is this: when I’m looking for information about an artist who I don’t know that much about; watching a music video of a group that makes me wonder how they ever made even one comeback; or analyzing a concept photo that leaves me questioning the entire cordi-noona empire –that is when my passion for Kpop kicks in, melds with my love of scholarship, and stokes my determination to get our work done right for the long-term fulfillment of the KPK mission. Burdick, Anne, et al. Digital Humanities. Cambridge: MIT Press, 2012. Web. Pannapacker, William. “Stop Calling it ‘Digital Humanities’.” The Chronicle of Higher Education. 18 Feb. 2013. Web. 5 Mar 2013.